The Sao Paulo motor show has been throwing up some juicy cars thus far. The next is something we don’t think about as being particularly butch, but infuse a compact FordEcoSport with some Ford F150 Raptor pickup truck bravado and the result is a toothy crossover that wouldn’t be out of place on a Halloween trick-or-treat excursion. Ford call it the EcoSport Storm. The huge black Ford lettering across the front gives away the F150 Raptor connection rather obviously. As do the swollen wheelarches, aftermarket-looking decals, and upsized 15-inch alloy wheels shod in nobbled 215/75 all-terrain tyres that looks more at home on a ‘fatty’ mtb bike than anything else. The storm also benefits from plastic body cladding to protect the ‘Blue Storm’ paint job and extra protection on the undercarriage for when it goes bundu-bashing. Under the bonnet it’s business as usual for the EcoSport with Ford sticking to the tried-and-tested 1.0-litre three-cylinder EcoBoost for propulsion. The Storm is the brainchild of Ford South America’s designers and is meant to highlight the customisation potential of the EcoSport SUV. 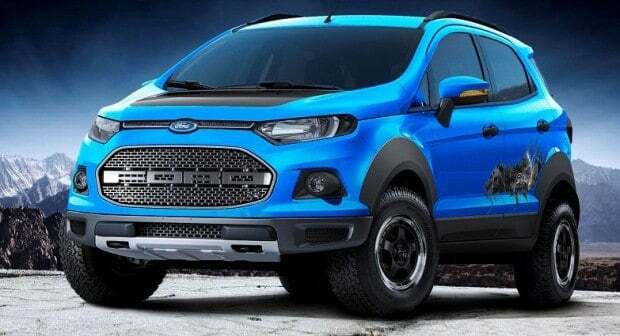 Ford showed off two other EcoSport concepts which explore the theme of ‘Beauty and the Beast’, but neither is as good as Blue Oval’s blue storm.